What is the "Ban The Bags" campaign? It has been a common practice for infant formula companies to distribute bags containing formula samples, coupons and other advertising to maternity patients in hospitals. Research has shown these free "gift" bags increase formula sales and decrease the duration of breastfeeding. This strategy has been successful as a marketing practice because the bags are given to mothers by healthcare providers, who appear implicitly to be promoting the use of formula. "Ban the Bags" is a national campaign to stop formula company marketing in maternity hospitals. Join this campaign and help us end a practice that costs parents money and leads to negative health outcomes for mothers and babies. The Maryland Breastfeeding Coalition fully supports the "Ban the Bags" campaign. We have sent a letter to CEO's of birthing hospitals across the state, asking them to support this initiative. We need your help to spread the word and encourage hospitals to stop giving out formula discharge bags to mothers. Call or write your local hospital today! The Maryland Breastfeeding Coalition has also prepared a brief presentation for health professionals to highlight the research regarding the effects of formula discharge bags and suggest how hospitals can approach banning the bags. This presentation can be found at http://www.youtube.com/watch?v=RNxp-0bm-Ms We encourage you to view and share it with other health care providers. The presentation is also available here for you to download. Massachusetts and Rhode Island have already discontinued the use of formula discharge bags in all their maternity hospitals. Let's make Maryland the 3rd state to go all bag free! What Maryland Hospitals Have Already Banned the Bag? The "Ban the Bags" campaign grew out of efforts in Massachusetts to stop aggressive formula company marketing tactics in hospitals The national campaign is working to educate consumers on the issue and encourage health care professionals and families in this effort. The campaign offers a Tool Kit, which includes educational materials developed by the Massachusetts Breastfeeding Coalition and Ban the Bags, as well as letters of support from regional and national organizations. Public Citizen is a national, nonprofit consumer advocacy organization that was founded in 1971 to represent consumer interests in Congress, the executive branch and the courts. The organization offers information to citizens on how to become more involved in consumer advocacy. Recently it has supported the Ban the Bags initiative. As part of its advocacy program, it is circulating a petition calling on the three major formula companies to stop marketing infant formula to new mothers in hospitals. It has also provides a copy of a letter they sent to over 2600 hospital administrators to stop the marketing of formula in their hospitals. 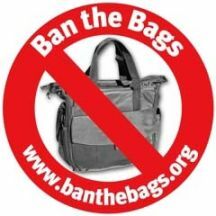 Read the latest press release on Ban the Bags Campaign from Public Citizen and the Maryland Breastfeeding Coalition. United States Breastfeeding Committee. (2011). Statement on marketing of human milk substitutes. Washington, DC: United States Breastfeeding Committee.